Modern DJs have many tools they can use to ease their work and even improve accuracy in their art. The Camelot Wheel is one of these tools, and it has become vital to every DJ. This wheel was invented by Mark Davis, one of the pioneers of the harmonic mixing technique. The purpose of the camelot wheel is to simplify the process of harmonic mixing by memorising the relationships between the various keys. This mixing technique involves the continuous playing of two separately-recorded tracks, and that is why memorising the keys is important. If you play two songs that have a poor key relationship, the whole set will be messed up. What Is the Camelot Wheel? The Camelot Wheel is a visual representation of the keys that have a good relationship with each other. Each key on this wheel is given a number that is between 1 and 12. If you don’t have much experience in DJing, you should start by mixing two songs that have the same keys. For example, you can mix two songs with the 8A key. To make things easier for you, the wheel is colour-coded. The Camelot Wheel is very simple to use. You can easily go from one key to the next, either in a clockwise or anticlockwise fashion. At the same time, you can transition from outer to inner keys. In the basic technique, any transition you make should be to an adjacent key. For example, if you are at 8A, you can go to 8B, 7A or 9A. Going to 9B or 10A will be a big step, and the keys will not always be complimentary. With this tool, you don’t have to pay much attention to the keys since the Camelot wheel will remember them for you. This is why it is such a great tool for harmonic mixing. Every key on the chart has four compatible keys. You can stay on the same key, move forward or backwards by an hour, or move inward or outward. However, some DJs mix diagonally along the Camelot wheel. For example, they can go from 8B to 9A, and the mix will still be smooth. If you are going from B to A, you should add one number, and if you are going from A to B, you should subtract one number. The individual keys are related, but you will need to experiment for some time before you start mixing diagonally. It is important to note that you cannot subtract one number when mixing from B to A since the scales contain dissonant intervals. Similarly, you cannot add one number when mixing from A to B. Mixing diagonally is an advanced technique and should be practised thoroughly before application. Another advanced mixing technique to consider is the two-semitone jump. This technique is best used for party mixes since it offers an energy boost. To jump two semitones on the Camelot Wheel, you will have to add two numbers. For example, if you are at 3A, you can jump to 5A. This gives an instant energy boost to your mix. You can also consider going up one semitone. To do this, you will need to skip 7 numbers. Skipping one semitone is riskier and will require a lot of practice. The two-semitone jump also does not work all the time, so you will need to keep your ears open and understand your playlist properly. Anyone who is serious about harmonic mixing should be familiar with the Harmonic Keys Overlay Chart. This chart displays all the compatible keys. 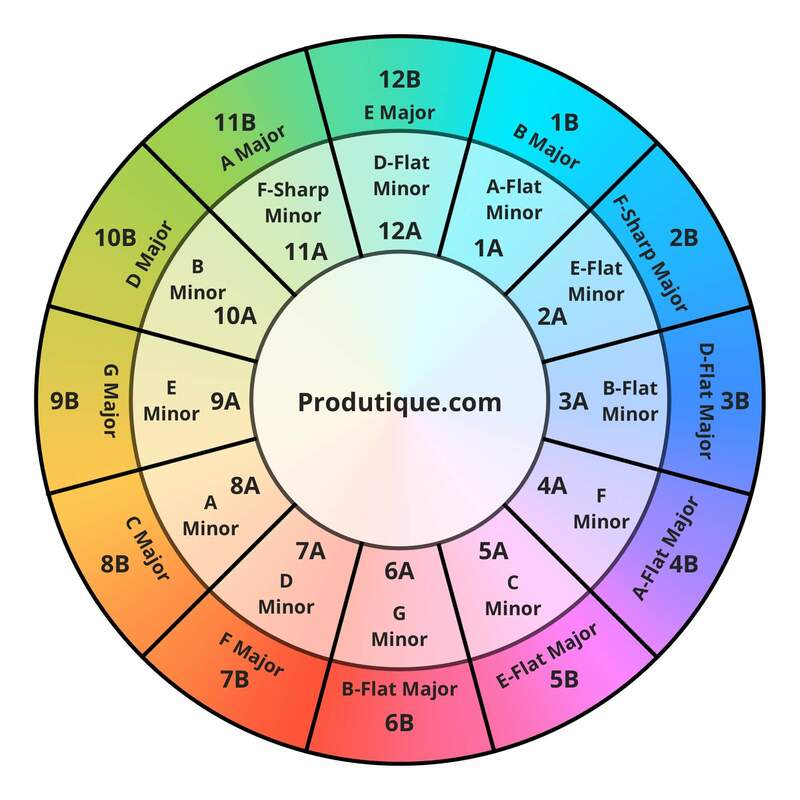 The problem with this chart is the fact that you have to actively memorise all the compatible keys so that your mixes stay smooth all the time. Not all DJs have such memory skills. This chart is actually what inspired Mark Davis to create the Camelot Wheel. Now, DJs don’t need to memorise keys. They simply need to choose the key they want to play next on the Camalot wheel, and as long as the keys are compatible, the mixes will always be smooth. The Camelot Wheel is a great tool for DJs. It was created by Mark Davis and has significantly simplified harmonic mixing. The Camelot wheel wheel has keys labelled from 1 to 12, just like a clock. Using it is quite easy. The basic technique involves staying in the same key or moving to an adjacent one. With some experience, you can learn how to create an energy mix with the Camelot Wheel.